Paulinda, Shayne, and Doreen at the 2013 Survivors Teaching Students event at Cedars Sinai. The program is sponsored by the Ovarian Cancer National Alliance (OCNA). A few weeks ago, I stood in the back of the auditorium at Cedars-Sinai listening to three run for her® team captains tell their stories to medical students and residents. I couldn’t help but tear up. No matter how many times I hear the personal stories of ovarian cancer survivors, the emotions are like the first time all over again. These team captains were speaking on behalf of a program called Survivors Teaching Students: Saving Women’s Lives®, where women “teach” medical professionals about ovarian cancer from the perspective of patients and survivors. I would like to share their stories with you. Paulinda told the story of losing her daughter Robin at the young age of 20. Robin Babbini was an active teenager and honor student, engaged in numerous high school activities — co-captain of the cheerleading squad, homecoming queen and active in dramatic arts. At the age of 17, Robin was diagnosed with Stage III ovarian cancer. She had a total hysterectomy followed by chemotherapy treatments. And with all this she was still able to complete her classes, graduate high school, and later began her freshman year at UC Santa Barbara. Unfortunately, six short months later, her cancer recurred and had metastasized; Robin lost her battle in 2006. Paulinda founded The Ovarian Cancer Circle/Inspired By Robin Babbini to honor her daughter’s memory (www.theovariancancercircle.org). She has made it her mission to educate young women about ovarian cancer symptoms. She visits Robin’s sorority, Kappa Kappa Gamma to talk about her daughter’s experience with ovarian cancer and educate young girls about this disease–a disease that many their age have no idea even exists. Doreen’s story begins where Robin Babbini’s story ends. Her daughter attended nursery school with Robin Babbini, so in 2008 Braverman attended a lunch and learn event that Paulinda was co-chairing. While there, she picked up a bookmark with a list of ovarian cancer symptoms. Later that year, Doreen experienced bloating around her abdomen while traveling — her mind went straight to that bookmark with the ovarian cancer symptoms. When she returned home, her gynecologist performed a transvaginal ultrasound and immediately referred her to a gynecologic oncologist who confirmed the diagnosis: Stage III ovarian cancer. Three days later she underwent surgery to remove the cancer and began chemotherapy. Doreen didn’t have a family history of ovarian cancer, but she had learned the signs and took action fast. That action saved her life. At age 38, Shayne was a happily married, busy accountant; she and her husband had been trying to conceive a child for almost a year. One day, she noticed that she was a little more tired than usual, and did not have much of an appetite. When she did eat, she would get horrible indigestion — something she had never experienced before – and a constant urgency to urinate. She thought, could I be pregnant? Shayne and her husband were leaving on vacation so she figured she would make an appointment to see her gynecologist when she returned. After telling her gynecologist about her symptoms, a CT scan showed a cloudy mass surrounding the right ovary so that afternoon she was sent for an MRI. The results showed what looked like a fibroid tumor. Just to be “safe,” the doctor said they should have it removed and biopsied. One month later, Shayne was diagnosed with Stage II epithelial ovarian cancer and had her right ovary removed. When my doctor spoke with my family and me, I didn’t hear anything the doctor said except the word CANCER,” she recalled. Shayne’s twins, Abigail and Hunter, helped mom spread awareness at the 6th annual run for her 5K Run & Friendship Walk in 2010. She was immediately referred to a gynecological oncologist who paid special attention to the reason this cancer was found: Shayne was trying to conceive a child. His recommended course of action took into consideration her wishes to preserve fertility if at all possible. Several surgeries later – which included removing her uterus and eventually her left ovary and six cycles of chemotherapy – Shayne knows that her determination to start a family is what essentially saved her life. She is now coming up on her third year as an ovarian cancer survivor. I want to thank Doreen, Paulinda, and Shayne for so generously sharing their stories. 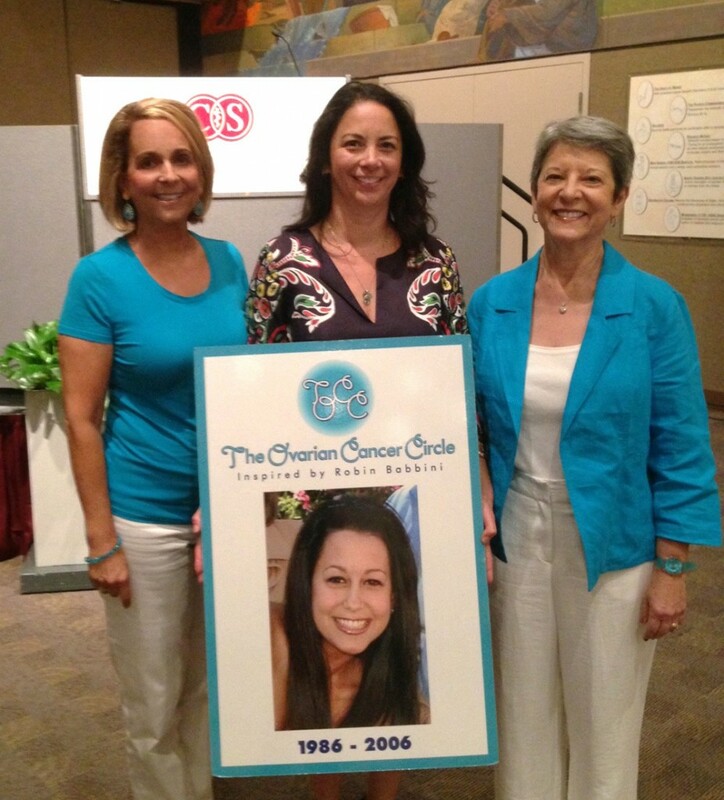 These three strong women have made educating others about ovarian cancer a part of their lives. 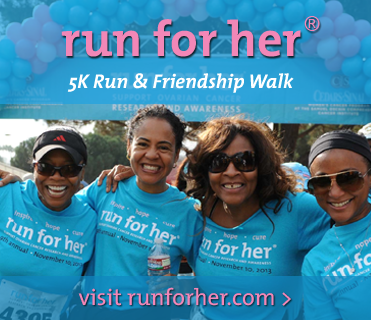 They join us at run for her every year with family and friends who are a part of their incredible teams, raising awareness and funds for the cause. They encourage and motivate others to participate and make a difference. 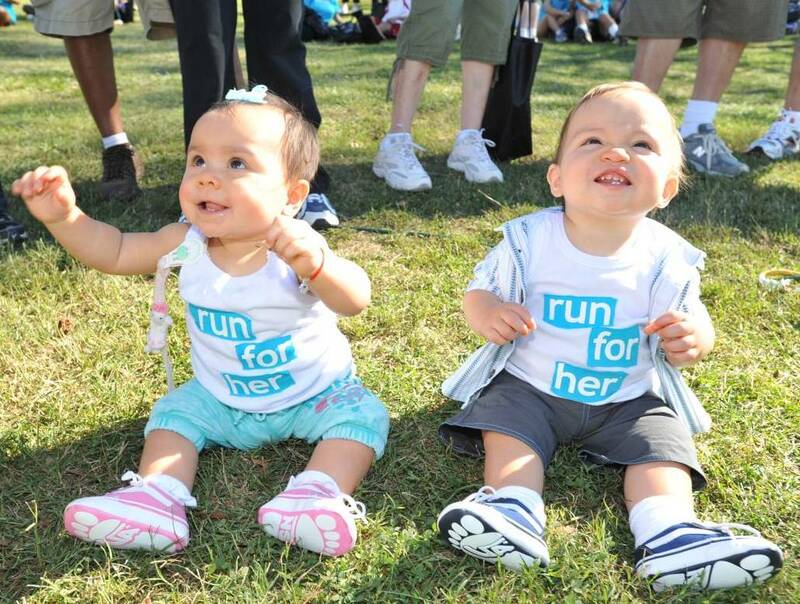 We look forward to welcoming them back on November 10, 2013 as well as all the teams and individuals who make run for her such an incredible day.